Are you a charity or nonprofit organisation, looking for more sustainable fundraising ideas that can help you with your causes throughout the year? Majority of charities and nonprofit organisations depend on donors and if you really wish to succeed with your fundraising ideas, you need to come up with the right ideas that work with your donors. Ideas that will persuade potential donors to check out your causes and support you in achieving your goals. Good fundraising ideas are those that can help you raise more money that would in turn help you to run your initiative / campaign and achieve your goal. There are several simple ideas that can help you raise money quickly. But a charity must always focus on ideas that offer them a chance to raise more money. In this article, we will discuss the big potential ideas that have help hundred and thousands of charity and nonprofit organisations to successfully raise funds for their causes. One thing to remember before we start discussing fundraising ideas is that not every idea will suit you or your organisation, so you must analyse and assess the outcome of each one and see how much it will benefit your initiative and cause you are fighting for. You must also carefully think what would work best for your donors, potential supporters and volunteers before you start your fundraiser. In this article, we will discuss top 7 most effective fundraising ideas for charities and nonprofit organisation, so that you can read through as many ideas as you can and implement the ones that best fit your organisation’s cause. Below is the list of some of the most popular fundraising ideas used and implemented by charities and nonprofit organisations across the United Kingdom, they are discussed in detail in this article so you can fully benefit from all these fundraising ideas. Inbound Marketing has become one of the hottest trends in the world of charity and nonprofit fundraising and marketing. Inbound marketing is, no doubt, one of the most effective ways of raising funds for your organisation because it helps in building traffic to your website and also creates a steady stream of fundraisers, donors and volunteers that will help in spreading the word in their circle and keep donating and raising money for your initiative all year long. Inbound marketing is all about creating inspiring, informative and educational content for your target audience. You can share it on your charity organisation’s blog or website and post it on your social media page to attract more traffic. You can also spread this information through email marketing. By telling your target audience the story of your nonprofit / charity organisation, your fundraisers will develop trust and would like to support you in your causes. Though sharing of inspiring and educational content, you also inspire your extended network and circle of potential constituents to fund and support you. Inbound marketing in this way, helps you to grow your community and regularly engage with your existing base of constituents. Inbound marketing encourages a charity or nonprofit organisation to create quality content that would attract potential donors, volunteers and supporters around the world to visit your website and find more information about your organisation and your causes. Your website will attract new donors and volunteers through its keyword rich content and blogs. Optimised content works like an anchor and pulls traffic toward your website, when you use it smartly. If you have enough traffic on your website, this shows that you created content and used keywords your target audience was looking for. Outbound marketing may not be the best approach to fundraising, because it consumes a lot of money as compared to inbound marketing. Moreover, its approach is quite different, in fact, it uses completely different techniques to reach out to your target audience. Inbound marketing allows you to be more persuasive and interactive with your donors and volunteers through the use of infographics, messages and blogs. With outbound marketing, charities can have TV commercials or quick popup ads on websites to get the attention of their audience. But outbound marketing does not work as effectively as inbound marketing due to its tools and techniques. Inbound marketing attracts your target audience, whereas, outbound marketing interrupts them. Inbound marketing is an effective way to acquire year round funding from potential donors and supporter through successful content marketing. The relationship between your charity organisation and your donors can be a little tricky to navigate at times. In such a case, inbound marketing is able to provide your organisation with a solid foundation and can enable you to cultivate a relationship of trust and faith through regular interaction. By developing quality content your organisation can feed the interest of your audience, captivate them enough to be receptive to your cause. Getting new potential donors and supporters into the pipeline is a key concern for many charity organisations and nonprofits today. Therefore, it is vital for charity and nonprofit organisations to cut through the clutter and market themselves in order to bring in new donors who feel for our cause and are willing to help you achieve your goals. Google has come up with a highly attractive offer for charity and nonprofit organisations that provides them a golden opportunity to put themselves out there and gain new donors, supporters and volunteers. Google provides a number of free tools and opportunities that enable nonprofits to spread the word about their organisation and all the good work they have been doing. Google does not only offer all these tools for free but when an organisation signs up for Google Grants, they are awarded with $7,000 per month in the form of free “AdWords” advertising. This lets you put up your ad on Google search engine so that potential visitors can see your link on top of the other results, when they enter a keyword and search it on Google search engine. Charity and nonprofit organisations consider it a very efficient and easy way to get maximum exposure from their targeted audience. Win support for their cause and raise a good sum of money to fund their activities. In order to keep your charity / nonprofit organisation well oiled and running in the long term, it is important for you to find and grow your donors and supporters as diligently as you work for your causes. This is important because it serves as the lifeline of your business. If you get proper donors and win their trust, it will be easier for you to work and focus on your causes and initiatives in the long run. Getting more donors is considered one of the most profitable and rewarding ways of fundraising ideas for charities and nonprofits. If you get big donors to fund your organisation, you will not need to spend money on organising huge events and persuade your audience to fund you. When you win your donors’ trust, you will be able to provide your organisation with a reliable backbone. Finding the right donors or major donors in the beginning is an extremely difficult job for most charity organisation, because at this point, many of them are just starting out and have not done enough groundwork or achieved something significant, in order to win their donors’ trust. It is best to use this option when you and your organisation have spent at least a year working on your causes and putting all your hard work and effort in making things happen. Once you have achieved a milestone through your activities, you can proudly share your achievements to your prospective and potential donors, supporters and volunteers, to get them to join you and fund you in the long run. Many of you might be wondering where to fund and how to develop charity donors for your organisation. You can start that by learning some of the best techniques in retaining donors and build your marketing strategy around it. You can also hire a fundraising professional in the UK to help you out in funding new donors and also help you retain them in the long run. One of the most important steps in acquiring big donors is to retain them. It is as important to retain your previous donors as it is to acquire new ones. Wouldn’t it be nice if you could make your donors stick around with you, supporting you in your causes in the long run? On average, it has been noted, that charity and nonprofit organisations lose approximately 70% of their new donors before receiving a second gift or funding. This is huge and it is possible if your organisation does not take enough measures to retain them. Fortunately, today we have leading professional donor retention experts who can help you retain your donors and get you the funding and support you need. They provide charity / nonprofit organisations with step by step donor retention strategies, tools and techniques. They teach organisations with unique and innovative ways to deepen their relationships with donors and supporters. Retaining donors is possible when your organisation creates opportunities for recurring donations. In order to get your donors to contribute their valuable funds regularly to your charity / nonprofit organisation, you should start a Monthly Giving Program on which your donors can register or sign up for their accounts and donate as low as $7 through Direct Debit to your organisation every month. Monthly Giving Program can be easily integrated into your charity website, and offers your donors the option of once off donation or setup account for a monthly donation. Before you start Monthly Giving Program, you should set a clear objective and tie it to your larger and long term fundraising goals. Branding and promoting your monthly giving program through social media is a great idea and can help you reach out to your target audience and potential donors / supporters. You can also make recurring donations / giving an option on your website where people can donate to your organisation 4 to 5 times a year instead of donating some amount every month. Crowdfunding refers to an effort by an individual or organisation to raise money for a project through donations from a group of people. Online crowdfunding websites, such as Kickstarter and Indiegogo provide charity and nonprofit organisations a platform to introduce themselves and their initiatives, post descriptions, pictures of their achievements to attract donations from potential donors. When you post your campaign on an online digital platform you can reach an incredibly diverse audience that can provide you regular funding which may not always be possible through your charity website or fundraisers. You can share your crowdfunding campaign page via Twitter, Facebook or any social media platform that you want. There is also the feature of live crowdfunding, that allows charity organisation to feature live events where a representative from your organisation can directly interact with your target audience, pitch your cause and encourage listeners to donate. In this digital age, crowdfunding has become an effective and huge fundraising method for charities and nonprofit organisations to have their causes funded by hundreds and thousands of people online. What is best about this fundraising idea is that you can receive a crowd of donations in a matter of a few hours through a single campaign page. Crowdfunding eliminates the need of holding fundraisers or community events. You can use your crowdfunding campaign page to introduce your organisation’s cause or initiative and receive general donation. All you have to do is register yourself at a Crowdfunding website and set up a campaign page to represent your cause to your target audience. Another great crowdfunding option for your charity / nonprofit organisation that could help you promote it at the same time is to use a T-Shirt crowdfunding campaign. You can reward your donors with a custom designed T-shirts with your logo on it. This is a brilliant fundraising idea for new charity and nonprofit organisations to attract new donors and give them something in return. Foundation grants is another great fundraising idea for charity organisations. There is loads of funding available to charities through Foundation Grants in the UK. But organisations are required to convince the grantors that their nonprofit or charity deserves their funds to achieve their goals. In order to succeed at receiving a foundation grant, a charity organisation should first find and identify foundation grants that suit their organisation and initiative. Next step is to write the most convincing and confident foundation grant proposal that convinces the foundation grantors that your charity or nonprofit deserves their funds better than other 100 charities competing with you for funding. Cause Marketing is another great way to raise funds for your organisation. Following are the most effective cause marketing techniques that charities and nonprofits in the UK can implement to raise funds. Point of Sale – In this method, either a shop cashier solicits a donation from the shopper or puts up a sign that prominently displays the organisation’s charity box and encourages shoppers to donate. Purchase or Action Triggered Gifts – In this method a small donation is provided when a customer either fills up a form or purchases any specific product, whose proceeds go to the charity. Licensing – In this method a company pays to display nonprofits’ brand on their products. This is usually done via an endorsement of the product by the nonprofit. Big and credible nonprofits and international health based charities use licensing. 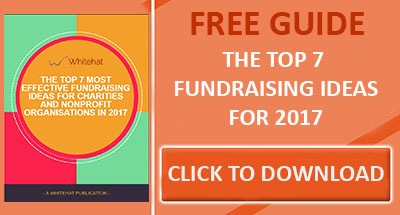 There are a number of fundraising techniques to raise funds and promote charity organisation. Key is to get maximum exposure for your charity organisation through your fundraising initiatives and attract big and small donors who would stick. This guide was written by Clwyd Probert, CEO at Whitehat who provide SEO services and Inbound Marketing to the UK charity sector. Whitehat are a London based inbound marketing agency.